When the ink clogged you could hold the metal tip over a flame for a couple of seconds. That melted the clog and the BIC would resume writing. You knew it was a clog because the plastic ink cartridge was see-thru and you could see there was still some ink left. Two commercials I remember from back then were the BIC ones and of course, TIMEX Watches! The base of the ink cartridge used to be metal. There was a TV commercial in which a female ice skater strapped a Bic pen to her blade and ground the point of the pen in the ice. It would be taken off and the pen point would be put through a flame. Using a pair of pliers to hold the cartridge, she wrote BIC on a piece of paper. You can't do that now: It's all plastic. Thanks for looking it up, "CJ" ! I knew some clever cat would have the information. That's why I enjoy this group. 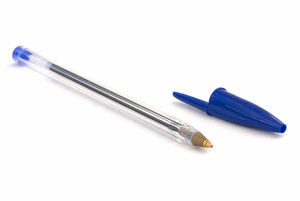 I searched Wikipedia and according to their research, the BIC pen was the company's very first product. They also introduced a BIC lighter to the marketplace in 1973: they guaranteed it could produce a flame "3,000" times; clever scientists at work or clever marketing. We were "the BIC master spit shooters" back in the 70s (re: public school). I lost that skill somewhere along the way. Does anyone know if "BIC" was/is one of those acronymns that actually meant something? You know, curiousity almost kills the cat - "bang." BIC pens changed: back in the day when they appeared "drained" they were kind of like Timex watches...they just kept on ticking/writing. They're still around. Can't fix what ain't broke. Hahahaha....yes I shot a lot of spitballs with these.But! my best memory of them was the commericals.The skater would attach one to their skate downward onto the ice....take a couple of laps and then write with the pen. "Writes first time..every time" This caused many a kid to give thier own "tests" just to see if that was the case.Not so. They did make the greatest "spit-ball" shooter. Take out the ink cartridge and the small cap on the bottom, cover the little hole in the barrel and you were good to go.